The spinal cord is a tubular structure, comprising of a bundle of nerves, extending from the base of the brain till the 2nd lumbar vertebrae. It consists of various segments from which spinal nerves exit. The length of the cord is 18 inches in males and approx 17 inches in females. There are 31 nerve segments in the cord, these are divided as 8 cervical, 12 thoracic, 5 lumbar, 5 sacral and 1 coccygeal. Injury to the spinal cord and its nerves, depending upon the severity, can produce symptoms ranging from pain to complete paralysis. Myelopathy is a condition afflicting the spinal cord. When it is the result of trauma to the spinal cord, it is known as spinal cord injury. Myelitis or myelopathy is the inflammation of spinal cord itself. Radiculopathy is a condition characterized by involvement of a single or group of nerves. It is caused by a compression or irritation of the nerve root as it exits and emerges from the spinal cord. The commonest cause of myelopathy is compression of spinal cord by a herniated disk (commonly called as slipped disk). Other causes include, trauma, compression from inside or due to external pressure, both due to tumours, cysts. Lesser causative factors include degenerative spine diseases, diseases causing infection and inflammation of the spinal cord. Radiculopathy is caused due to pinching of nerve. This happens as the surrounding muscles, bones and tissues suffer injury or change position. This results in compression of the nerve root causing symptoms. Nerve compression can be the result of a herniated disc, trauma, stress, incorrect posture. Commonest cause for radiculopathy is seen in cervical spine, causing neck pain and associated hand tingling. Also, commonly seen is lower back pain, with pain radiating down the leg due to sciatic nerve impingement. Signs depend upon the level and extent of the cord involved. However, the common symptoms that develop in myelopathies are Weakness, clumsiness and altered tone of the muscle. Bladder and bowel irregularities, sexual dysfunction might occur if the cord is affected in the lower half. Sensory changes causing either decreased sensory perception or increased sensations might be noticed by patients. In radiculopathy, depending upon the location of nerve involved symptoms can be neck pain and hand tingling, backache with pain radiating to the leg. The pain sometimes increases on coughing, sneezing or lifting heavy weights. Numbness of skin in the leg or foot and a loss of reflexes might be experienced as well. MRI is the mainstay for diagnosing myelopathy. Clinically, the diagnosis is done by locating the segment of cord involved depending upon the signs and symptoms. X-ray is the first investigation done to diagnose a radiculopathy, followed by MRI or CT scan if necessary. Myelopathy is fairly difficult to treat and complete treatment rarely happens. If trauma is the cause, posture stabilisation is the first step. If tumour or cysts are the causative factors, surgical removal must be done to provide relief. However in radiculopathy, symptom relief is much easier to obtain. This can be achieved with the help of painkillers, anti inflammatory drugs, exercises, correction of posture, yoga and relaxation techniques. Symptoms often improve within 6 weeks. Myelopathy is the affection of spinal cord due to various causes, while radiculopathy is the involvement of a nerve root, either single or multiple. Symptomatic treatment of radiculopathy is much easier as against myeoplathy which is difficult to treat completely. rachita. "Differences between myelopathy and radiculopathy." DifferenceBetween.net. 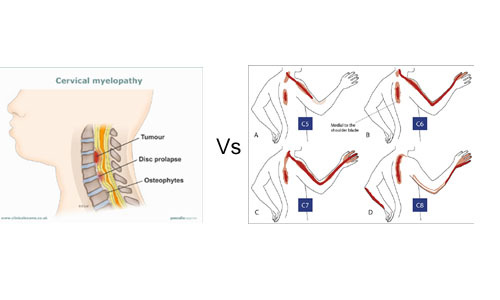 December 28, 2014 < http://www.differencebetween.net/science/health/differences-between-myelopathy-and-radiculopathy/ >.